Merry Christmas. 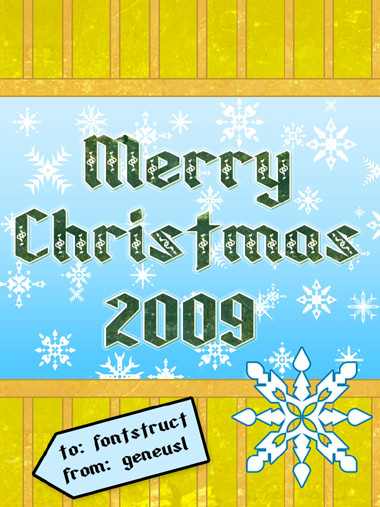 Happy Holidays to all fontstructors worldwide and the Fontstruct staff! and Snowflakes to all. Info: Created on 12th December 2009 . Last edited on 13th January 2010. Another fontstruct masterpiece that lives up to your name, Gene. You dusted off a bit of your fs collaboration 1 musings and took ‘em the distance, I see. Or perhaps this has been poised for awhile, awaiting this perfect hour of offering. The workshop elf in me thinks you have other version of this...actually you could have many versions of this textur typeface with extended character sets to boot! Keep them well! They deserve a proper release, and this takes not a bit of sweetness from your present to us. Your compliments of ornamentality are much appreciated. Thanks, Frodo. Your recent work in the 2:2 filter seems to say otherwise. Please keep exploring and sharing. Thanks, Will. Am I that easy to read? You hit it right on the head with the FS Collaboration source reference. 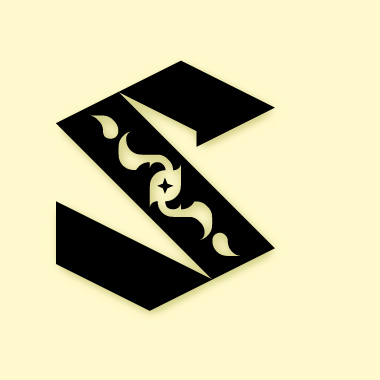 The entire font was created from the letter "s." I did have to dust it off, as it was only earlier this month that I started to develop the lowercase letters. There are two versions of this, but unfortunately I haven't created the full uppercase or numerals yet. Thanks again for noticing the little details in the traps. It was hard adding originality to the font with all the great blackletters concocted on FS. I'd love to see what you're brewing. Congratulations! FontStruct Staff have deemed your FontStruction worthy of special mention. “Kallosia Decorative” is now a Top Pick. I & I am doubly gob smacked. What a wonderfully detailed ornament to throw into a fabulous looking black letter. Thanks for this yuletide gift, Gene. Here's to smacking more gobs in 2010! 2:2 Filter makes it all possible. crazy work !! I'm really impressed !!! i love it ! Congratulations! FontStruct Staff have deemed your FontStruction worthy of special mention. “Kallosia Decorative” is now a current Featured FontStruction. another outstanding addition to your library displaying your consummate skills as a fontstructer/typographer. congrats. @afrojet: Featured Fontstruction! And I'm in good company with the other blackletters featured. Thanks. That was a nice incentive to finish up the capitals. I think it's probably all been said really... Seems to work well at all sizes too - great stuff.